Typically I space out my followup reviews a bit more, but a lot has happened with Authorr.com since my Authorr.com review went live about a month ago, none of it good. Here’s what I’ve experienced after just walking through the steps to get my screenshots for the review – bear in mind that I never even submitted my (extremely specific, free) sample. Just when you thought we wouldn’t make any more changes, we did. This week we updated our system to remove the bidding process. That’s right, we no longer ask for a bid or take bids into account when we calculate your overall score. From here on out, the focus is on quality. So go forth, Authors, and make us proud! Okay…so…no more bids. A step in the right direction? I guess? Hopefully you remember us. At some point in time, you submitted a sample for our value article writing type but for some reason, it cancelled and you weren’t able to complete it. I’m here with really good news. We recently made a bunch of changes in Authorr and would like for you to drop in and give that sample submission a second shot. Before you submit your second sample assignment, we encourage you to watch our webinar and review our guidelines. If you weren’t sure what our expectations were before, you will definitely know now. Both were created in the last couple of weeks, so there’s plenty of fresh tips and tricks about how to be successful on Authorr. Thanks so much and happy writing! Okay, well, I never submitted in the first place, but I can understand them wanting to maybe call back some folks that wandered away. This tells me they’re hurting for quality writers though, it has a slightly-too-eager tone to it in my opinion. As we mentioned on our webinar a few weeks ago, we are now re-opening the Premium Article assignment type. These pay out $30 for a 500 word article and 6 cents per word after that, so $60 for a 1,000 word article. 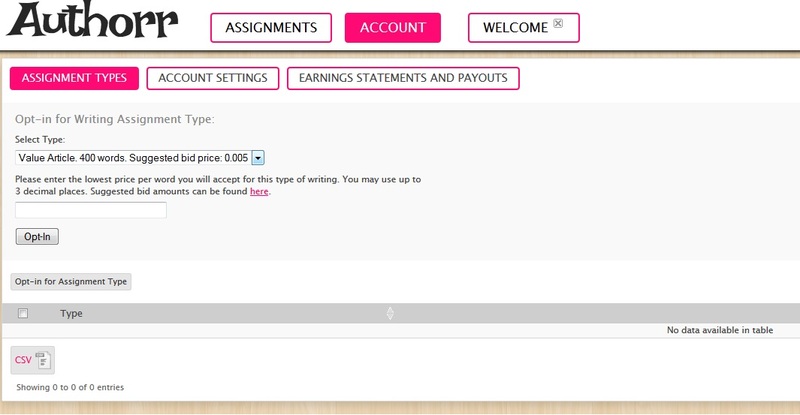 To opt-in for the Premium Article type just log in to Authorr, and click Assignment Types under the Account tab. Alright, now they’ve crept slightly over the line of being a little too eager. Two emails in the same day, to the same person that didn’t even submit a sample, encouraging them to apply for premium level? What kind of hurried talent is that going to snag you, guys? Premium isn’t something you should be casting about for from the untested pool, this email should only go out to established writers. This E-Mail is to let you know that we have work available for you on Authorr. There are currently 1 assignments available to you that you can work on. 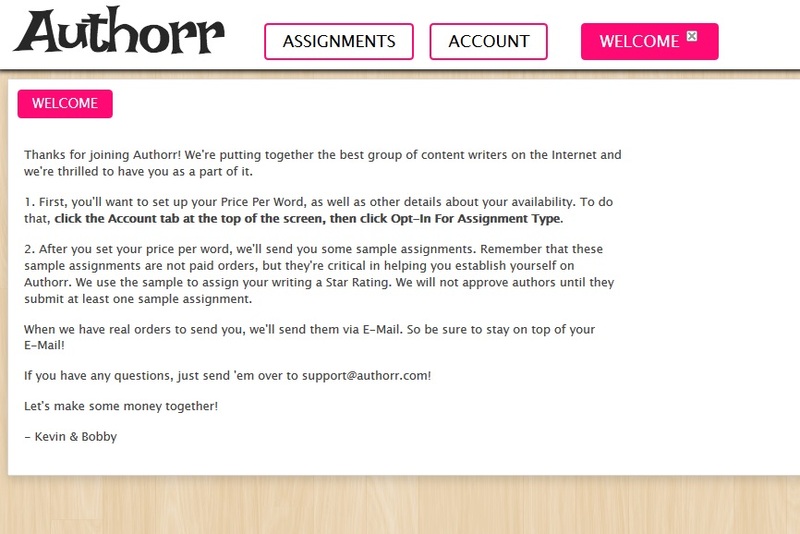 Assignments on Authorr are first-come, first-served, but we do expect that if you accept an assignment that you will complete it without delay. If you’re ready to do some writing, please sign in and accept the assignment. Know what that one assignment was? My unpaid sample piece they’re apparently VERY EAGER for me to start/finish. That’s all I have access to, that one 500 word SEO specific-theme-and-audience timed assignment that it looks like they get the rights to and I get zilch for. See where it says I can adjust “frequncy” at the bottom? Apparently the default setting is FOUR EMAILS A DAY because I’ve been getting “reminders” about that sample piece assignment every six hours for the last three days. This is now almost a month after I dabbled on their site and poked around – nearly 4 weeks since I touched anything or logged in the site, and suddenly – bam – four emails a day, every day, out of the blue. Some of my readers here on the Freelance Writer Guide were quick to speak up on their own negative issues on the site, too – email neediness aside. I wish I had read this article before I had signed up with Authorr. I’m new to freelance writing, and also learned of it through Freedom with Writing. I’ve had issues with Authott at an alarming rate. Twice this week their timer on their site has had errors, and timed out long before the six hour deadline. That issue resulted in projects that I had put time into being lost and marked as failed. One of them errored out while I was submitting it. I’ve reported the issues, they acknowledged that it was a bug on their end, but I highly doubt I’m ever going to get paid the $7 that I feel I am owed. After all, I did the work. I’m getting a bad feeling about the site, personally. Unfortunately, your submission for #7218 (Independent Contractors vs Employees) on Authorr fell short of our standards. We will not allow you to access further assignments in this type. 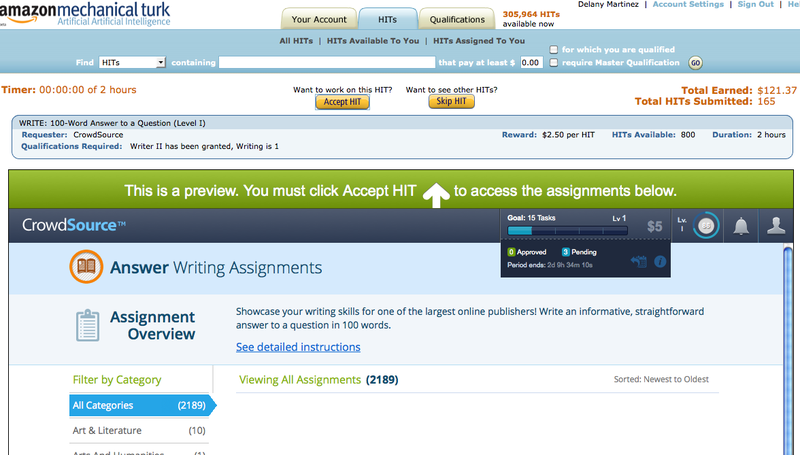 Feel free to resubmit a new sample assignment in a different assignment type. So, they must have checked me out, as I have already had a fallout with editors, asking them straight whether or not they read the articles or the emails sent by the authors. Did not expect brownie points for that. Still, I would love to know “their standards” as I was given a straight, level 3 starter grade when I applied with The Content Authority, and have not had any problems with the editors so far. I get regular reviews and detailed comments from the site, something Authorr would never implement. I think I am “ditching” the site for good, and many authors are already leaving because of the ignorance of the company. I don’t think I’ve ever received chimes of “me too” quite so quickly on a site review before, which makes me even more wary of Authorr.com. Who knows, maybe they can salvage themselves in time, but right now it looks like a terribly executed site that’s up to some underhanded nonsense when it comes to free “samples” of your hard work. Freelance Writer Guide Asks: Is Authorr.com legit or Is Authorr.com a scam? A commenter on my Crowdsource.com review asked me about Authorr.com, so I decided to check it out at length. Authorr.com is a bid-based freelance writing site that requires authors to apply and, once approved, bid on individual jobs on the site against one another by offering the lowest amount per word they’re willing to accept. How do I start at Authorr.com? From there, you’ll need to hit the “Account” button and, via a fairly user-UNfriendly form, apparently “opt in” to receiving certain assignments to take – as I was just starting out, the only thing open to me was the “Value” articles, and take a gander at the suggested rate – .005, aka half a cent per word. As you’ll recall, I emphatically stress in the Freelance Writer Guide that not even new freelancers should not accept less than a penny a word. I have, in fact, taken other freelance writing sites to task for routinely putting out projects with terrible sub-penny rates. The next step after putting in my bid (I went with .01/word for experimentation’s sake) requires clicking the “Assignments” button. 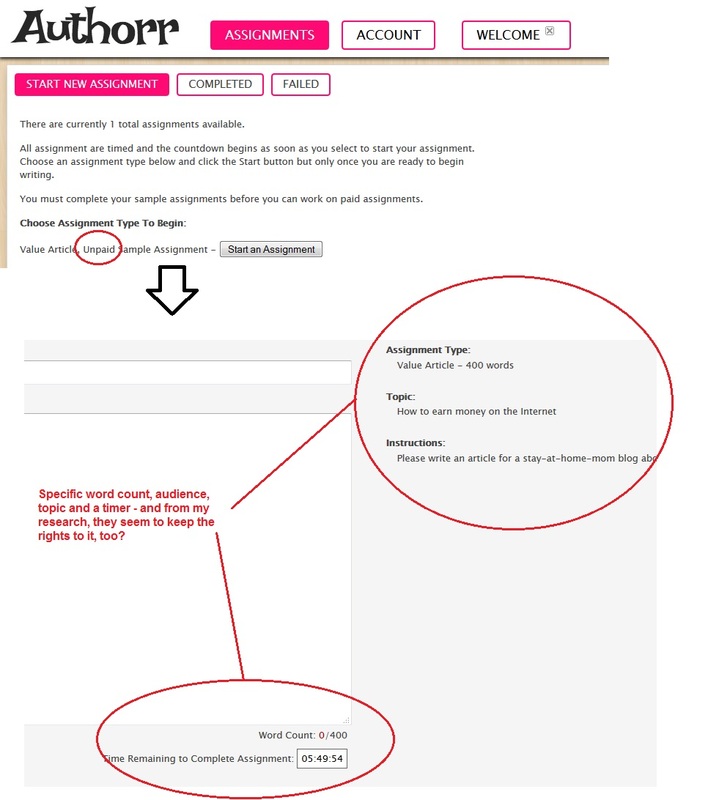 At this point, I want to remind my readers that Authorr.com mentioned that you’d need to submit some samples to actually be accepted to work, but had not up until this point mentioned if those samples could be previously written/published, nor specified if we’d be paid for them if they had to be new. It’s worse than my freelancer spidey-sense had envisioned. They give you the word count, topic, audience and timer and you fork over free work. Okay, so 400 words is nothing to sneeze at, that’s a solid half hour of work for even advanced freelancers, and when you add in the restrictions of topic and audience, it may be even longer. I hunted through the site and also found nothing that suggested the writer retains rights to their work, which essentially means that Authorr.com likely keeps it, sells it, and keeps the profit. This is akin to the Craigslist writing scams and Freelancer.com scams that solicit fresh “samples” of work on specific topics with an open cattle call and, unsurprisingly, never seem to get back to the folks that submitted it. Add that to the fact that the owners of Authorr.com, Velluto VIP LLC, are also behind a few SEO-work-for-hire firms such as ProReporting.com and you have a “Hmm.” moment on your hands. How do I get paid with Authorr.com? Authorr.com pays with Paypal, but no word on frequency. There’s also a nod that they may start paying in Bitcoins – a troubling, financially volatile concept at best for freelancers that depend on a steady income. Skip it. If their opening pitch is half a cent a word and they’re asking for a 400-word freebie out of the gate, you can bet that respect for the profession isn’t exactly prominent on their corporate horizon. 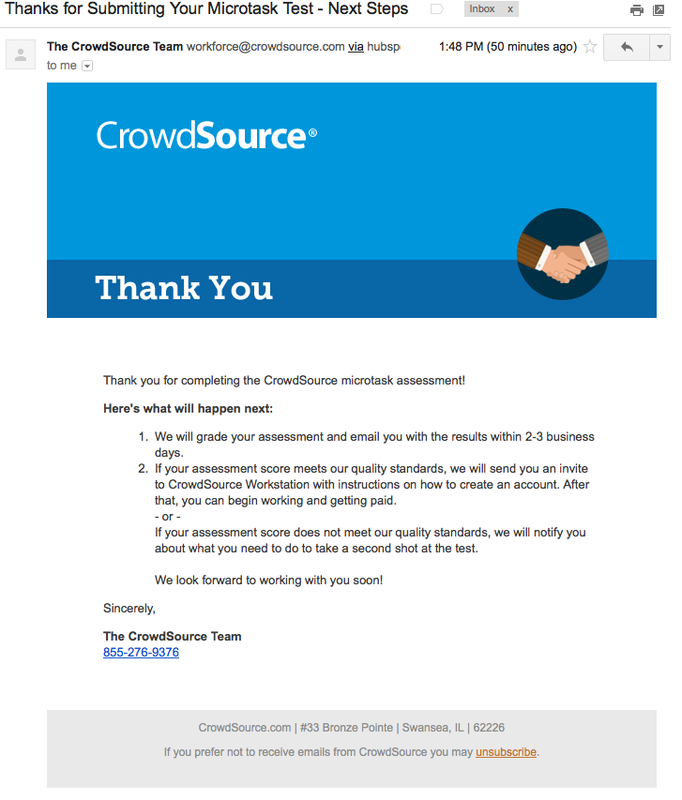 Freelance Writer Guide Asks: Is Crowdsource.com legit or Is Crowdsource.com a scam? 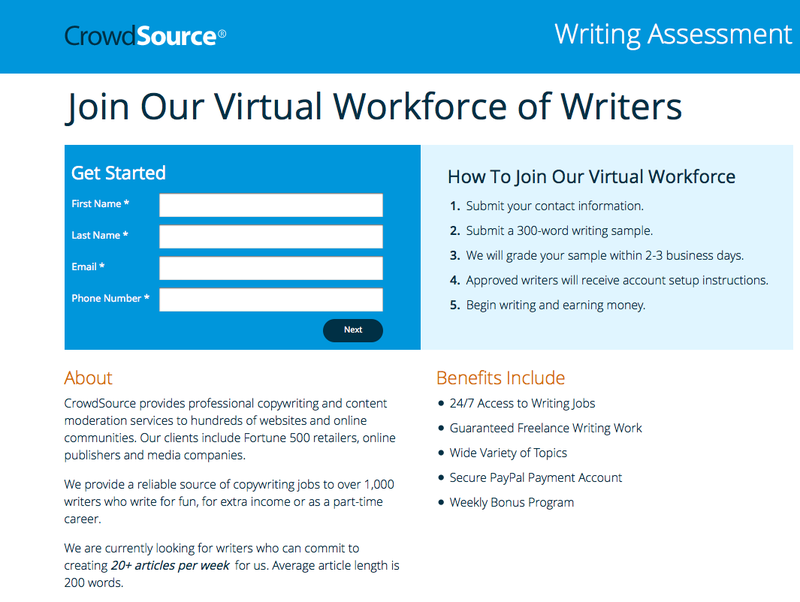 Crowdsource.com is a content mill-style freelance writing and microjobs portal site, as well as the latest incarnation of Write.com, which in turn “ate” the freelance writing site platform CloudCrowd last year. What does this mean for you? Several things, and they’re all pretty positive. You’ll recall I panned Write.com in a previous Write.com review, citing a bait-and-switch style setup that lured in writers and then promptly stuck them with microjobs and little hope of advancing. Not so, anymore. The proverbial path is much clearer, there’s ample opportunity for bonuses, and there’s little to no confusion about what you’re trying out for and how to start working online for money. 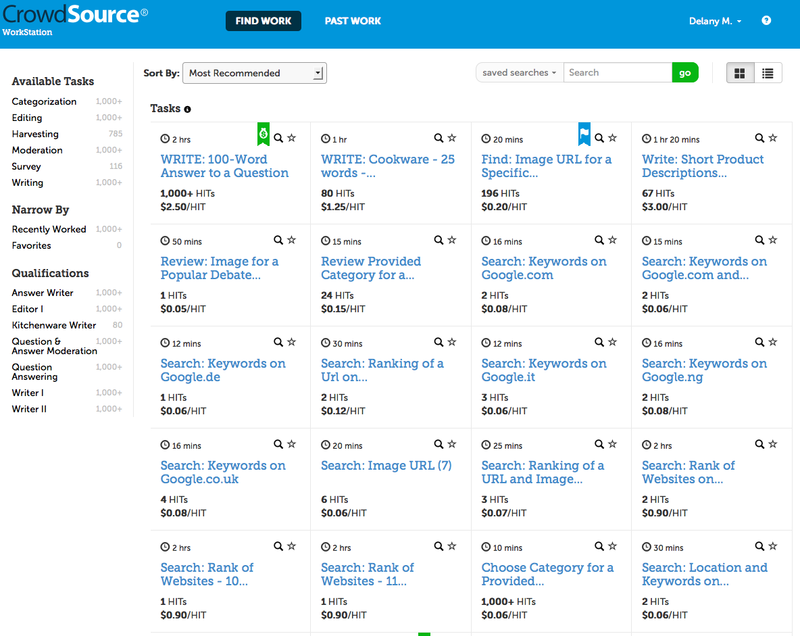 Crowdsource has effectively unseated Textbroker.com as my ‘go to’ place to herd fledgling freelancers looking to make a quick buck through computer work. How do I start at Crowdsource.com? 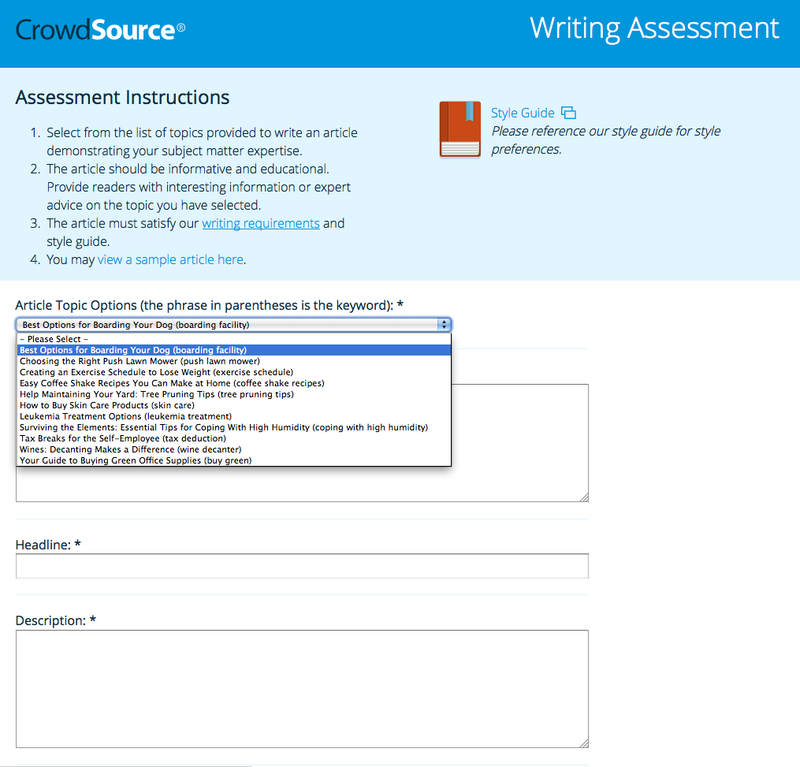 When you apply at Crowdsource.com, you will be able to choose one of two ‘paths’ – writing for money online or doing microjobs for money online. Each path has its own assessment, but you are not restricted to one or the other – go for both, if you’d like! 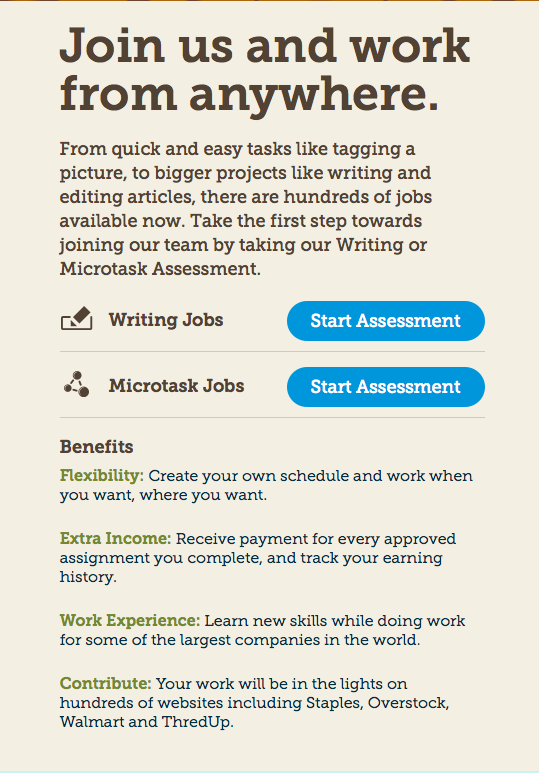 As with most freelance writing sites, the writing path requires you to create a new, unique piece – the microjobs path just has you answering a series of multiple choice questions, with a handful of “find this thing online” sort of searches towards the end of the test. 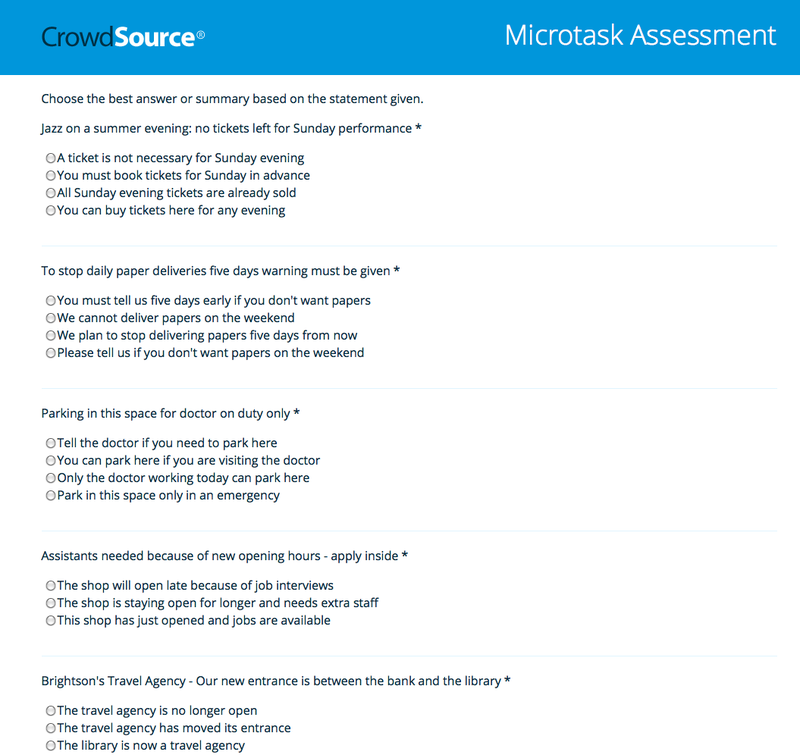 Neither the microjobs test or the writing test on Crowdsource.com looks to be timed, so you have the ability to consider and research a little if you need to. 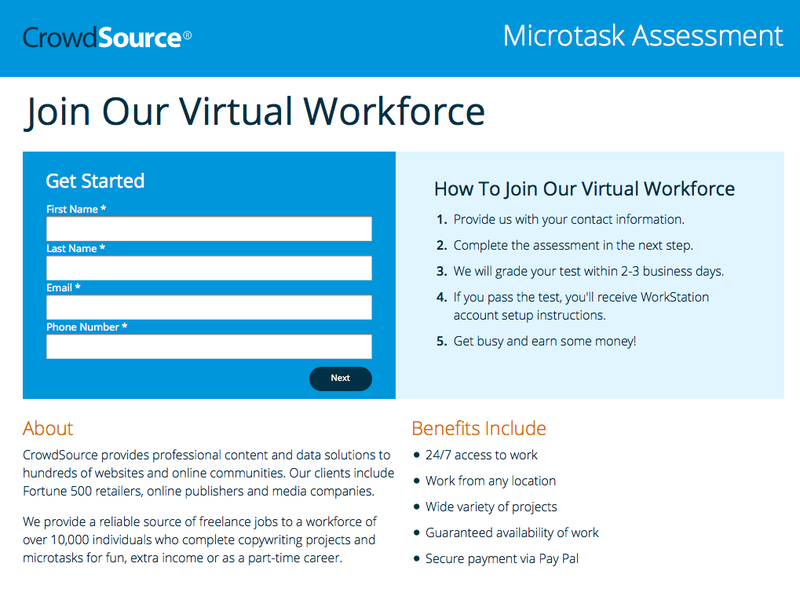 Info on the Microjobs Test: It’s pretty easy and straightforward, if you’re fluent in English with a mind towards basic logic, you’ll be fine. There are 20 or so multiple choice questions, and – for me, anyway – one where you need to count the number of pieces in a bedroom set being sold on a site, another where you need to determine the toe shape of a woman’s shoe being sold on a site, three questions where you need to isolate and cut-and-paste the employee page url of a given company’s site (pay attention to the instructions on this one), and a final one where you need to find the name of a certain employee of a company. These questions are all pretty indicative of the type of microjobs you’ll be doing, if accepted. They’ve made it fairly easy for you to block out your article, and in fact they follow my guidance on how to write a freelance article, a subject we’ve previously covered on the Freelance Writer Guide. How do I get paid with Crowdsource.com? Crowdsource.com pays through two methods, and you’ll have to select one: Paypal or Amazon Payments. I do not have an accurate idea of what is ‘normal’ for pay method selection in terms of new incoming workers on Crowdsource.com, I’m basing this on what I see when I log into my Crowdsource.com account, which was transitioned from Cloudcrowd when the company was absorbed. Amazon Payments is the only off-Amazon payment option offered on the Mturk platform, which Crowdsource.com still works through. It requires a connection to a bank account, much like Paypal, and users can request payouts from their Amazon Payment balance into that account, a process which takes 2-3 business days. If you are given a choice of the two, I’d suggest Paypal for the convenience and the Paypal debit card option. How is the overall experience at Crowdsource.com? Pretty darn smooth. I was anxious to write an “updated” Crowdsource.com review because they’ve worked on their interface quite a bit and brought some of those slick, user-friendly graphics from Write.com into the fold. When you log in as a worker, you’re presented with a grid that lists all the jobs that are available to your current positions (Writer I & Writer II, Editor I & II, etc). Available work grid at Crowdsource.com. Clicking these links will pop you over to their requisite listing over on Mturk.com, unless you’ve selected Paypal as your payment method, in which case you can work straight off the Crowdsource site. Eagle-eyed readers likely noticed that little green moneybag shown on one of the available work squares on the grid. This denotes a bonus – what used to be a confusing and frantic scramble for freelance writing pay bonuses on the former Cloudcrowd platform has been streamlined and made user-friendly. 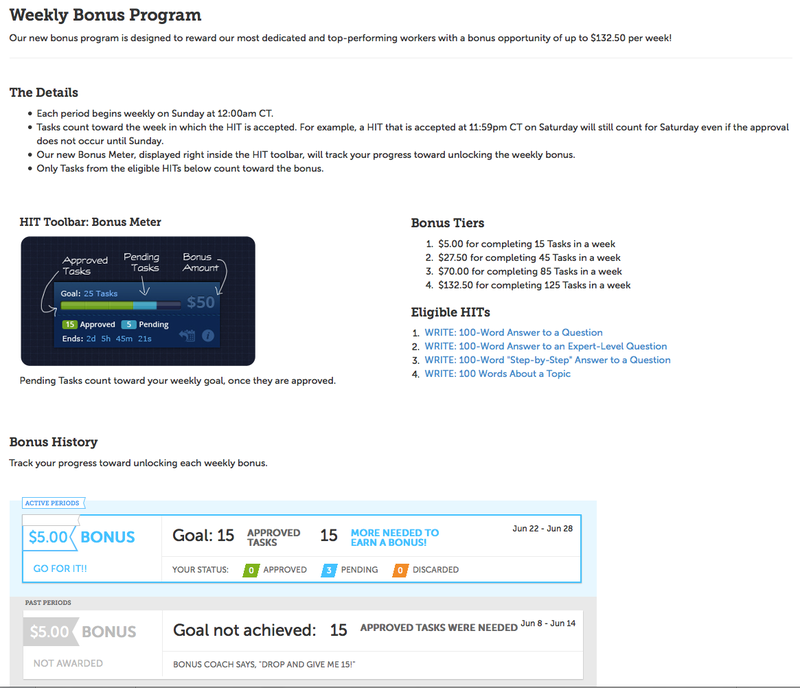 A little in-job interface keeps track of how many tasks you’ve completed towards the bonus, how many you have to go, how many are pending, and so on. Crowdsource.com editors (aka fellow freelancers) take awhile to grade/approve/reject tasks after you’ve done them. If you’re working on HITs/Microjobs or writing tasks on Mturk, expect a 7 day delay before an editor gets to them. If it happens earlier, great, but if it doesn’t this buffer will keep you from counting your chickens before they’re hatched. Keep an eye on the countdown timer for bonuses. You don’t want to end up with half of your work in one week and half in another, causing you to miss the bonus despite completing the tasks. Generally, the earlier in the bonus period you hit your ‘milestones’ of 15, 45, etc tasks, the better you’ll be – that gives editors time to get at your work. Some editors are…questionable at best. Get a thick skin and learn to just roll your eyes a little when they feel compelled to dissect your work for a personal grammar preference. It’s a pass/fail system of advancing into slightly higher pay grades, so don’t sweat the small stuff as long as you’re passing. UPDATE 7/10/14 – I would caution potential writers against the higher-paying ($5+) jobs here. My adage encouraging you to wave off work with instructions longer than the project itself holds very true on this site, which is notorious for posting page after page of must-read documents for jobs under 500 words. The editing team (other freelancers) is often not inclined to assist or support your writing growth, and I found out the hard way recently that just stating “Instructions weren’t followed” and rejecting a piece apparently passes as editing. Thanks for reading my Crowdsource.com review, and be sure to take a look at my other freelance writing site reviews through the navigation tab above! Textbroker.com is a content mill site for freelance writing jobs, which means that the site posts a variety of writing jobs from an array of clients that can be individually picked up by writers. 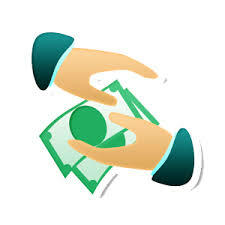 Textbroker collects money from the client and, once the client approves submitted work, pays a portion of it to the writer. How do I start at Textbroker? Author registers on www.textbroker.com under the registration link on the “I Write Content” page. Authors fill out all information. An automated email is sent that with a link to click to confirm the author’s email address. Author must log in and submit a writing sample of about 200 words. Textbroker will review the writing sample and request a US ID by email in most cases. Once we receive a scanned, faxed or mailed copy of the ID, we will verify it and rate the sample. Authors are rated from 2-4 stars with sound writing fundamentals (spelling, grammar, avoiding fluff content and repetition) being high priorities. Textbroker sends an automated email requesting a W-9 form. The author can begin to write. We require a signed faxed or mailed copy of the W-9 before the author requests their first payment, but the author can start writing right away and build up a credit. For expedited processing, authors should start the process with their state-issued ID and W-9 form handy. Depending on registration volume, we process the US ID and rating within about one business day each. We only accept US writers over 18 as well. How do I get paid with Textbroker? Like many content mill sites, Textbroker.com uses Paypal as a sole form of payment, so you’ll definitely need an account. Cutoff time for work (which must be accepted/approved) is Midnight Las Vegas time (PDT) each week, and the payout for those jobs will occur the following business day, though the time does vary. Payout minimum is $10, and your payout must be manually requested by clicking a button on your payout page. How is the overall experience at Textbroker? I have a special fondness for Textbroker.com – like a passionate affair that ended on a sour note, I still carry a lot of good memories from the site and will always be grateful to them for kickstarting my now-thriving freelance writing career. When I really began in earnest there, it was taking up a long-forgotten approval that I managed to garner when I was with my ex-fiance, who constantly told me that writing wasn’t going to amount to any real money and really discouraged my exploring freelancing. I poked at the site listlessly and wrote $10 here, $20 here, never cracking double digits for a month because I constantly heard that negativity in my head. When my ex and I split and I took up with my now-husband, he encouraged me to pursue my writing and for a long while it was our sole source of income as I flourished. I was offered five star status to work on a very prominent client’s roster through Textbroker, and eventually I was pulling in pretty decent paydays towards late 2010/early 2011, clearing more than a grand a month. Then the other shoe dropped and myself – along with many other 5-star status holders – were informed we were in violation of offenses that had never even crossed the radar in the three years prior – split infinitives chief among them, for me. My writing style and skill hadn’t changed, and in fact more than a few clients remarked on my skill, but Textbroker continued to find strange issues more befitting a college thesis than a 300 word piece on plumbing repair in Chicago, IL. Error after error showed up in my random reviews, until one day my status was knocked down to 4. I attempted to talk to the higher-ups there, only to be rebuffed and handed the same strangely elevated standards with the edict that three perfect reviews in a row would grant me my status again – a feat that was essentially impossible at the time, and probably still is. The 5-star list took a massive hit in those fateful months, and a very large group of formerly 5-star Textbroker writers decided to pursue options elsewhere rather than tangle with the odd new demands. Later, when the mass of 5-star ex-pats conferred on public message boards, it was found that a too-large-for-coincidence group had the same experiences, right around the time when the previously-mentioned prominent client pulled their account. In addition, those that had passed the proofreading test (a requirement for moving up to 5-star) and moved onto the review portion of their upgrade application had all received the same entirely-subjective ‘awkward phrasing’ ding that kept them from advancing. The takeaway? Textbroker is an excellent place for new writers to start, as they usually have a good deal of work at the lower levels and they do pay promptly every week. It’s a good place to get used to the ‘system’ behind most content mill sites, but once you’ve got your rhythm down, head off for greener pastures, because 5-star status is inexplicably difficult to obtain and even harder to keep. You can only take one open order job and one ‘private’ job at a time, so choose wisely. Your rate of dropping/letting articles expire is recorded behind the scenes and it will prevent you from moving up a star level, so treat deadlines as firm.